The Agilent N8242A arbitrary waveform generator synthetic instrument module combines the unprecedented performance of Agilent’s AWGs with the unsurpassed flexibility of scalable modules. High sampling rates of either 1.25 GS/s or 625 MS/s, and 10-bit resolution enable designers to create ideal waveforms for accurate test of radar, satellite, digital radio, and frequency agile systems. Each channel provides either 500 MHz of modulation bandwidth (for the 1.25 GS/s sampling rate), or 250 MHz of modulation bandwidth (for the 625 MHz sampling rate). With over 65 dBc of spurious free dynamic range, very high-fidelity complex modulation signals can be generated. 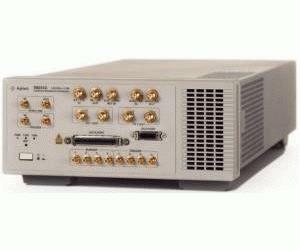 When the N8242A is combined with a wideband I/Q upconverter, modulation bandwidth of 1 GHz (for the 1.25 GS/s sampling rate) or 500 MHz (for the 625 MHz sampling rate) can be realized at microwave frequencies for authentic signal simulations for IF and RF subsystem test. See a photo of the small modular size mounted in a rack.